Conventional wisdom holds that the internet makes the world flat and reduces friction by erasing the impact of the physical world on our buying habits. But Wharton professor and marketing expert David R. Bell argues that the way we use the internet is still largely shaped by the physical world we inhabit. Anyone can go online and buy a pair of jeans — but the likelihood that we will do so depends to a significant degree on where we live. The presence of stores nearby, trendy and friendly neighbors, and local sales taxes, among other factors, play a critical role in our decision making when it comes to buying online. Our willingness to search for and consume information also depends on where we live and whom we live next to. 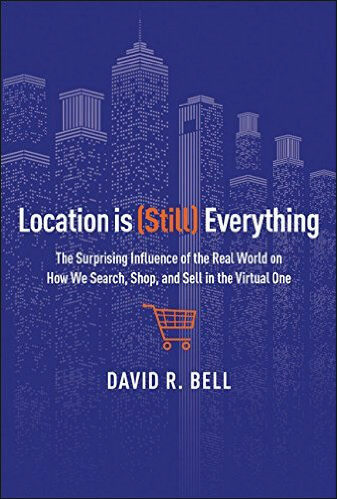 In Location Is (Still) Everything, Bell offers a fascinating, in-depth look at online commerce and retailing through his years of research, investing, and advising experience. His unique GRAVITY framework is a powerful and practical tool that uses fundamental human behaviors and location-based conditions to explain how the real and virtual worlds intersect — and what internet sellers must do in order to succeed. Entrepreneurs, managers, students, and investors will all benefit from understanding how and why we use the internet to search, shop, and sell.